Williston, Vermont—MBF Bioscience announces the release of WormLab™, advanced software that provides research scientists with invaluable data about the behavior of C. elegans. C. elegans are tiny worms that are used as model organisms in many research fields including genetics, toxicology, human development, and neurodegeneration. They are increasingly used in research studies because they have a simple structure that is well understood and they share many of the same biological characteristics as humans. 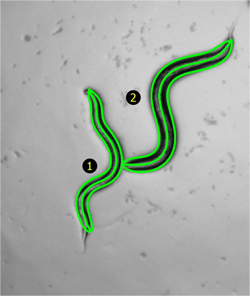 WormLab gives researchers a wide variety of accurate and precise analyses about C. elegans locomotion, including position, speed, direction, and wavelength. The software can track and analyze a single worm or multiple worms, even as they interact or become entangled—particularly difficult events for software to track. “We worked with scientists and visited labs around the world to identify the needs of C. elegans researchers. WormLab is a user-friendly software package that is a true breakthrough for the field of C. elegans research. It delivers powerful analyses that researchers need to draw new conclusions and advance their field of study” says Jack Glaser, President of MBF Bioscience. This software integrates with microscope cameras to capture video sequences of C. elegans moving in a dish under the microscope. It can also read virtually any video file format captured with other recording software. The full system, both hardware and software, comes with MBF Bioscience’s quick and helpful customer support to keep your system running at the highest level. MBF Bioscience produces industry-leading microscopy imaging and analysis systems, including Neurolucida® and Stereo Investigator®. The award-winning company was co-founded in 1988 by Edmund and Jack Glaser.